Fired Up! 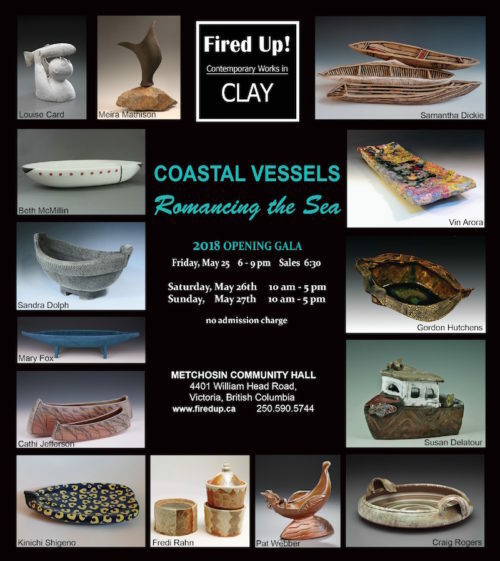 Contemporary Works in Clay, May 25-27, 2018, in Metchosin B.C. 5 fabulous guest artists from B.C. will join the Fired Up collective for our annual exhibition and sale. The exhibition work responds to the theme of Coastal Vessels: Romancing the Sea. A wide array of functional, decorative, sculptural and conceptual ceramic pieces will be for sale. Hope you can join us.